250 km north of Rovaniemi. Lake Hommajärvi 70 m (length 230 m, width 170 m), deep water, pier. Vuontisjärvi lake 500 m, where own boat available. Wooden villa 2012, kitchen, 2 bedrooms 2 beds in each, sleeping loft with 4 beds (steep stairs), sauna (electric stove), bathroom, dressing room with sofa bed, utility room, toilet, large open porch. Outdoor sauna (wood heated stove) nearby, hot water tank on stove, electric light, no running water. Carport and ski maintenance room.WLAN available free of charge. 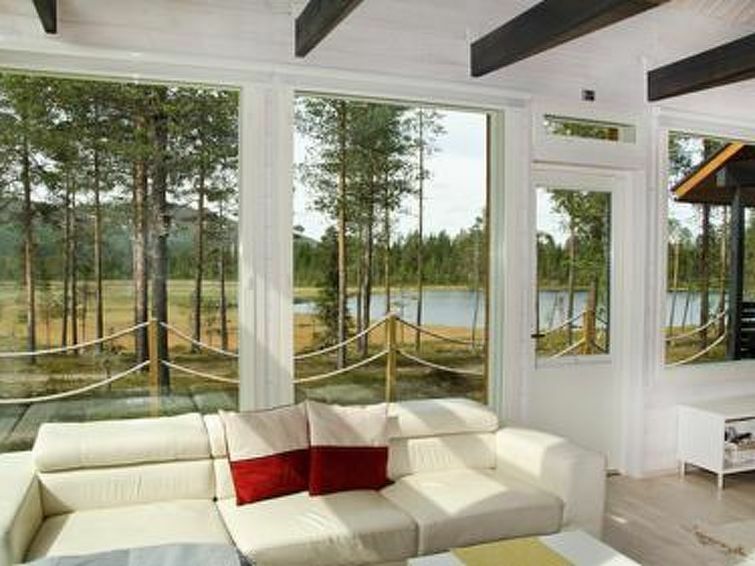 Villa Biegga is a high quality holiday villa in the stunning Pallas-Yllästunturi National Park mountain scenery in Enontekiö. Villa Biegga provides an ideal setting for a comfortable holiday in all Lapland's seasons.Living room with large windows gives the feeling like you're part of the beautiful landscape. As a part of the interior are local nature photographer Tomi Valo's photo art pictures.Location close by the areas of Pallas-Yllästunturi National Park. Ski trail nearby. Kayak, 2 mountain bikes, 5 pairs of cross-country skis, 2 sleds and winter fishing tackles available. Hotel Vuontispirtti 1 km (open during high seasons), reindeer farm 5.5 km, where canoe rental and possibility for meals. Nearest shop, restaurant and e.g. horse riding possibilities in Raattama village 6 km. Pallastunturi ski resort and visitor center 33 km.Kayak, bicycles, cross country skis, snowshoes, Lapp's sledge and ice fishing equipment available. Blu-ray -player.Now also Fatbike available free of charge. Fatbike has wide tires and is also called snowbike, as it is designed for winter use. Neighbour is cottage 13293.